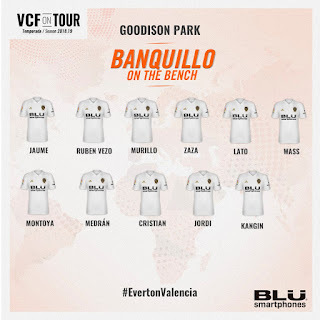 Valencia scored a decent win in their penultimate pre-season friendly with the team producing their best performance of the pre-season. 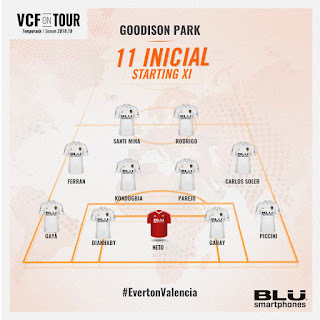 VCF went with a line-up that will probably be similar to what we'll see next season, though the club will hopefully have Guedes or a left winger and an extra forward or two by then. Marcelino experimented with Ferran on the left for this one. Both teams started energetically and it was Valencia that drew first blood. Ferran put in a pinpoint cross from the left, Soler showed good decision making, controlling, when he could have shot, and then pulling the ball back for Rodrigo to score. Thereafter, we struggled to creat clear cut chances and Everton had more attacks. Neto produced a great save to keep us ahead but couldn't do anything about the equaliser. Soler's clearance was poor and somehow Sigurdsson managed to evade 4(!) 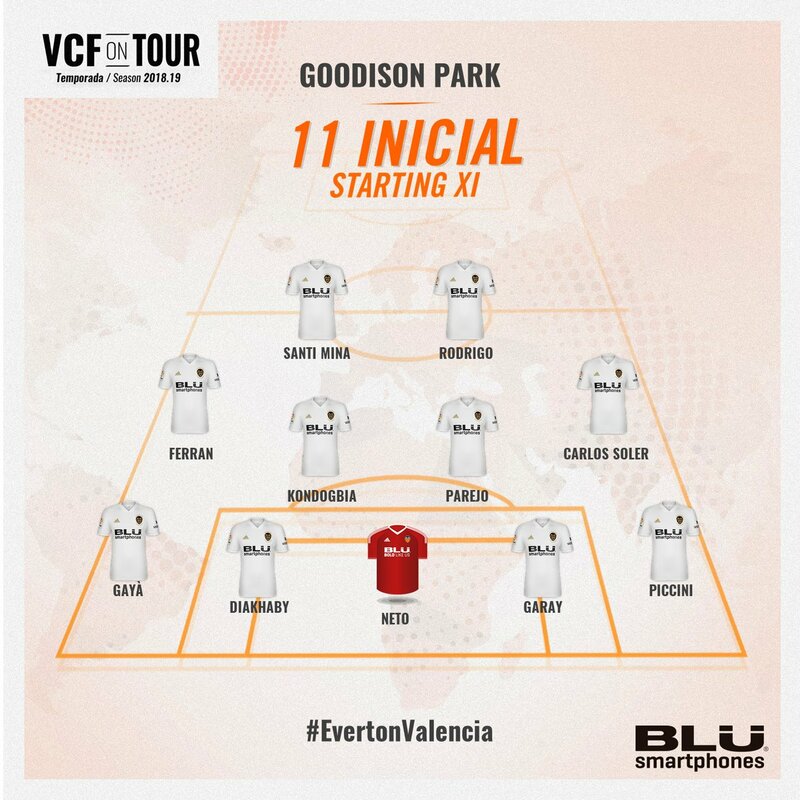 Valencia players to pass to Tosun in space and his low drive made it 1-1. Just five minutes later we were back in front. Great cross from Piccini and Rodrigo managed to evade his markers to head home. Rodrigo was our best player on the day and in an energetic first half I was also impressed with Ferran, Diakhaby, Piccini, Neto and Parejo. Garay and Mina were disappointing and Soler and Gaya were below their usual quality. Everton equalised again in the 29th minute and it was an annoying goal. A corner found Keane who had escaped his marker, who seemed to be Kondogbia, and Keane headed home at the near post. The type of goal that we conceded too often last season and Marcelino will be annoyed that the defence still don't seem reliable at dealing with corners. Mina scored a good goal just after that but was wrongly judged to be offside. At least we'll have VAR next season to take care of that. After half time we started to see some of the subs, starting with Wass and Jaume. The latter had an ok game, but is still suspect at aerial balls. He flapped at one or two and punched when I felt he could have caught. Wass didn't do too badly. He missed a good chance from a Gaya centre but made up for it after that. Sandro and Coleman got in a tangle for Everton, Wass stole the ball, drove inside and thumped home the winner from just outside the D.
All the other subs came on except for Cristian Rivero. None of them really impressed me. Zaza and Jordi were invisible. Kangin Lee has good potential but looks at least a year away from being ready for first team action. Montoya's mind is elsewhere (Betis?) 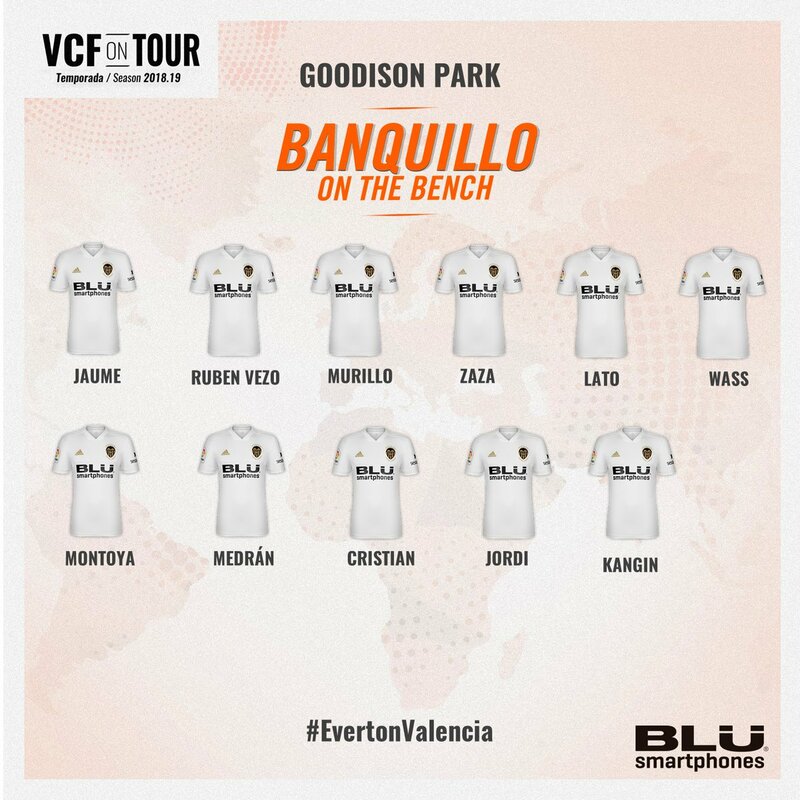 and Vezo made a couple of mistakes which will prove costly if repeated against better teams. Overall, a good result. Everton are around the level that Betis are currently at, so an away win there is good. However, we have defensive issues which still need sorted if we are to challenge for last 16 of the Champions league or top four of La Liga. Defending set pieces is the main one.